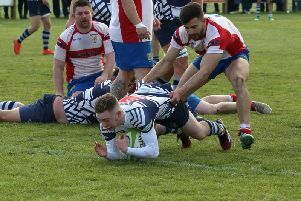 Leighton Buzzard stopped their five-game losing streak in it’s tracks with a 20-6 win over Bugbrooke. Tries from Wills Messum, Jordan Cummins and James Ward stopped the rot, much to the relief of head coach Tom Mowbray. He said: “The recent defeats against top league opposition helped to galvanise our team spirit and develop confidence in certain areas of our improving performances. “Our game management was a key focus going in to this game and I was delighted with both 40 minute halves. “We got our team selection and tactics right and can look forward to next week’s trip to Huntingdon. Leighton kicked off with the benefit of the slope but playing into a strong wind. The visitors used the wind effectively, kicking well to take initial territorial advantage. After five minutes, Bugbrooke converted a penalty for offside to take a three point lead. Despite the wet and windy conditions making ball handling difficult, Leighton put together one of their trademark back moves to put Ben Beaumont in space. Although the initial threat was defended, Buzzards were now deep in Bugbrooke territory. The ball was recycled through the phases before Wills Messum slipped his tackler and sprinted in from twenty-five metres. The difficult conversion was missed, but Leighton led 5-3 after eleven minutes. The rest of the half was to follow a similar pattern – the Buzzard scrum with Jon Henkes at tight-head was dominating the set piece , including winning a number of scrums against the head. However, conditions led to the ball being frequently knocked-on, a lot of possession being turned over and a frustrating period where neither side came close to scoring. With a narrow lead at half time, but now with the benefit of the wind, the home crowd were confident. Despite this climatic advantage the early minutes of the half were played mostly in the Buzzard half with Leighton perhaps guilty of trying to play too much rugby, when a clearing kick was required. Fourteen minutes into the half, Bugbrooke had a penalty opportunity to take the lead but the ball drifted close but past the Buzzard left- hand post. Inexplicably the referee, who otherwise had a fine game, chose to over-rule the touch judge in the best position immediately behind the post and awarded the kick to leave the score 5-6. Perhaps spurred on by a sense of injustice, Buzzards improved their game. Now kicking intelligently and working through the phases when attacking, the half-time game plan was put into operation. This allowed a control of the game resulting in a try for Jordan Cummins following a move from a line out after eighteen minutes. Darren Braybrook converted from the touchline to extend the lead to 12-6. A further Braybrook penalty after thirty minutes extended the lead to 15-6, meaning that the visitors would need to score twice to win the game. With Buzzard’s improved game management, Bugbrooke were unable to threaten the line. With Leighton apparently playing out time, man of the match Reece Harris-Smith, turned over possession and, with the last play of the game, put James Ward away with a clear run to the corner. The difficult conversion was missed to leave the final score 20-6.